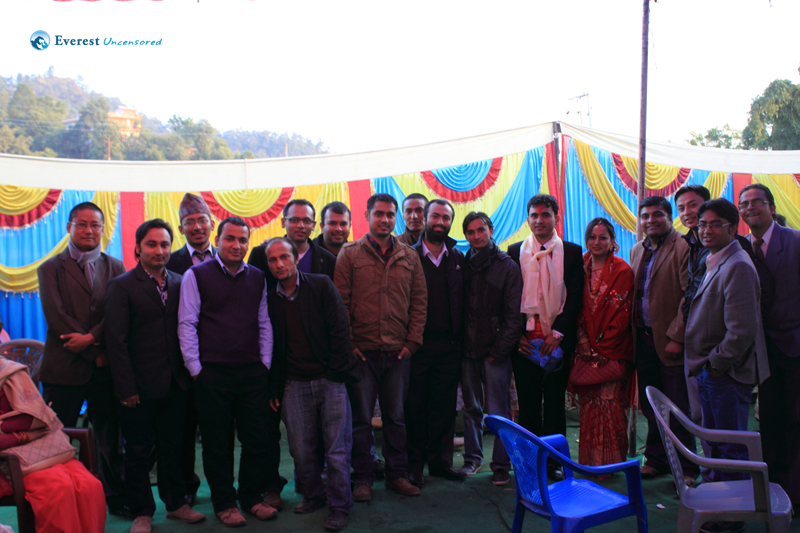 On Saturday, 1st Dec 2012, fourteen Deerwalk employees and I went to Pokhara to attend Bikram dai’s wedding reception. We were supposed to leave Deerwalk office at 6:30 am. However, some of us had our clocks set to “Nepali time” and therefore had to leave at 7:00 am. The prospect of attending Bikram dai’s wedding and being in Pokhara excited us all. When we crossed Thankot and the road started winding around the hills, I felt a sense of freedom away from the polluted Kathmandu city. Ram dai took us to Naubise where we stopped for breakfast of “masu-chiura”. We continued on the winding road and stopped at Damauli for lunch. We got to the famous lake side of Pokhara to find a hotel and freshen up before going to Bikram dai’s wedding reception at Lekhnath.